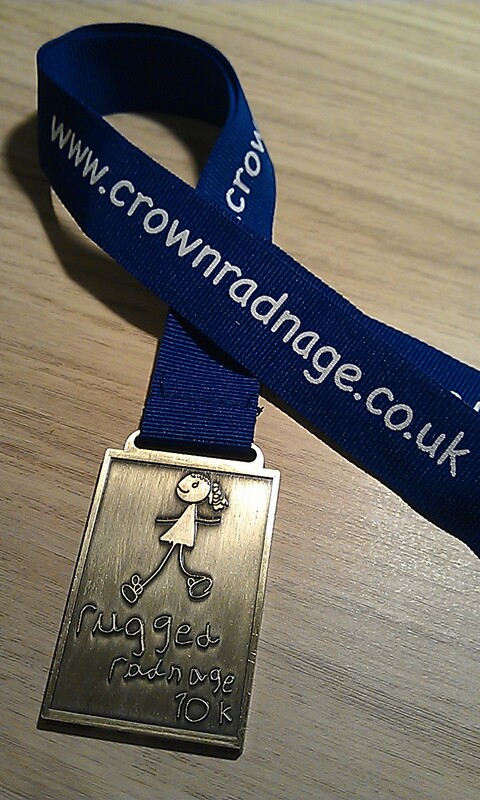 This morning I took part in the Rugged Radnage 10K. The what? I hear you ask. 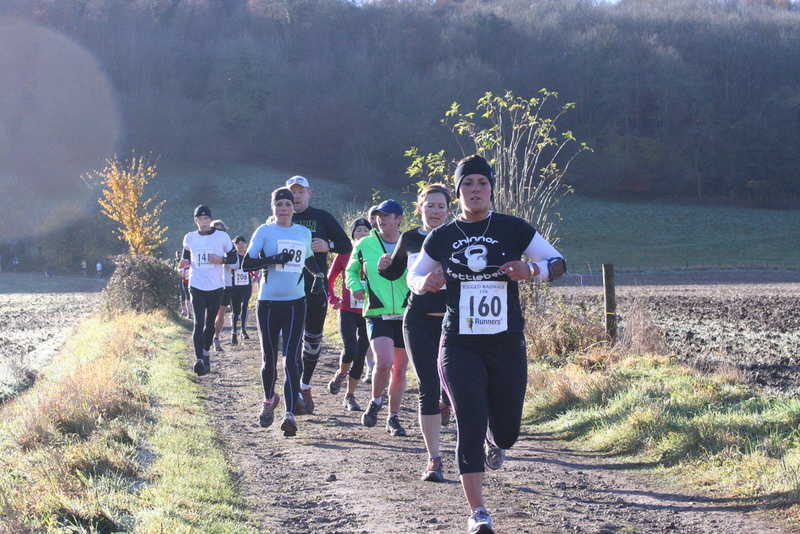 The RR10K is a small locally run multi-terrain 10K race starting and finishing in the small Buckinghamshire village of Radnage. It was a fantastic event – brilliantly organised and in a beautiful area. Oh and there were hills. And mud. Read on for the full story and some photos – AND ENTER NEXT YEAR. So how did I come to take part in a small 10K 90 miles from home on a cold November morning. Basically through following @RuggedRadnage on twitter aka Denis (pronounced Denise) Currie-Godbolt. How I came to be following Denis is another whole story but it involves @Rowenanews and the London marathon 2012. Denis was taking part. I was there with Rowena supporting. Denis ran past. Whole story here. Race HQ was the village hall where food and drink was on offer plus decent loos but most importantly – warmth. I soon bumped into Lady Race Director Denis who recognised me or my number and pointed me in the direction of the tweetup where I met Johnny Logan @Dunsrunner who had travelled all the way from Scotland for this event, Florian and Catherine (@stoerminator and @mrsstoerminator), Ken (@kjhughes), Mike (@mikew30) Martin (@teamb_o_b) and others – even some who don’t tweet! And then we were off. We headed off back through the village and soon headed off into the woods and down a tricky track down into the valley. Quite a tricky decent with lots of flints to take your ankles out on. Glad I had my trail shoes on. Down in the valley we had a long ascent along a track and I remember thinking I was running too fast but I kept going with the pack. 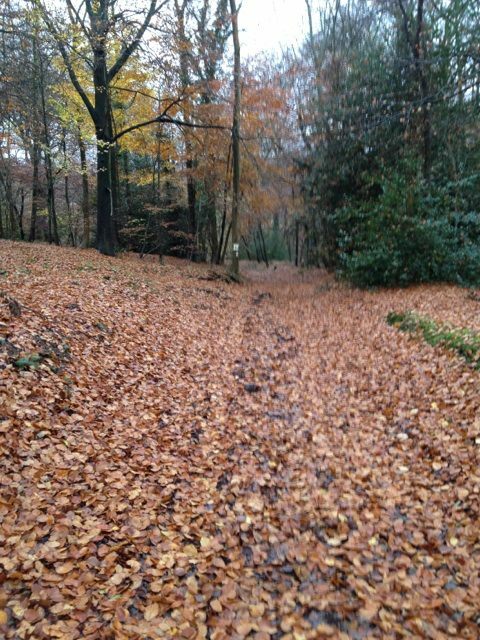 The track turned into a trail through the woods again which steadily steepened and got muddier. 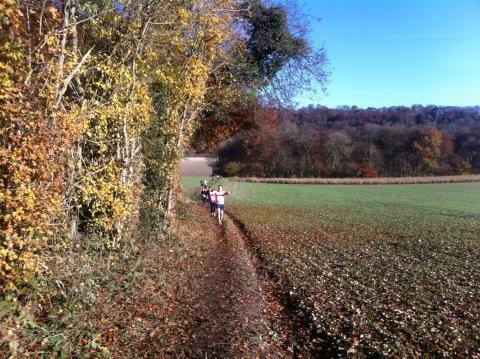 Running through the autumn foliage was great. After about 2.5 miles the trail turned steeply right for a 150 yards of steeeeeep uphill which I managed to start running up – and then didn’t. And walked the rest to the top. A flat and muddy stretch soon turned into a long downhill leg of maybe a mile and a half which was great but took a fair amount of concentration on foot-placement. It struck me then how much more interesting and mind absorbing trail running is than just pounding a pavement (which is pretty boring tbh). 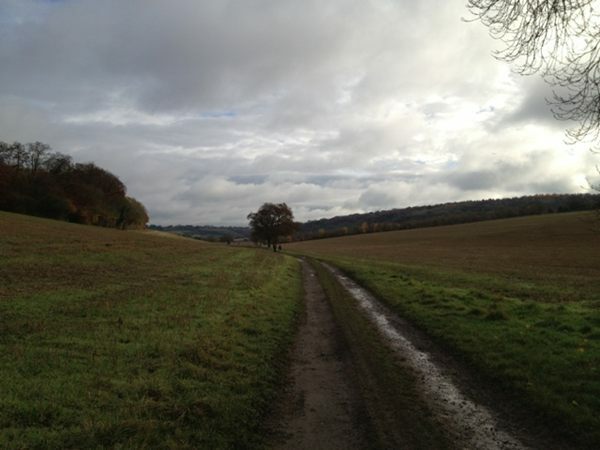 Note to self – do more trail running. Out from the woods and still on a gradual decent we returned to tracks and then onto a back road for maybe 1.5 miles. 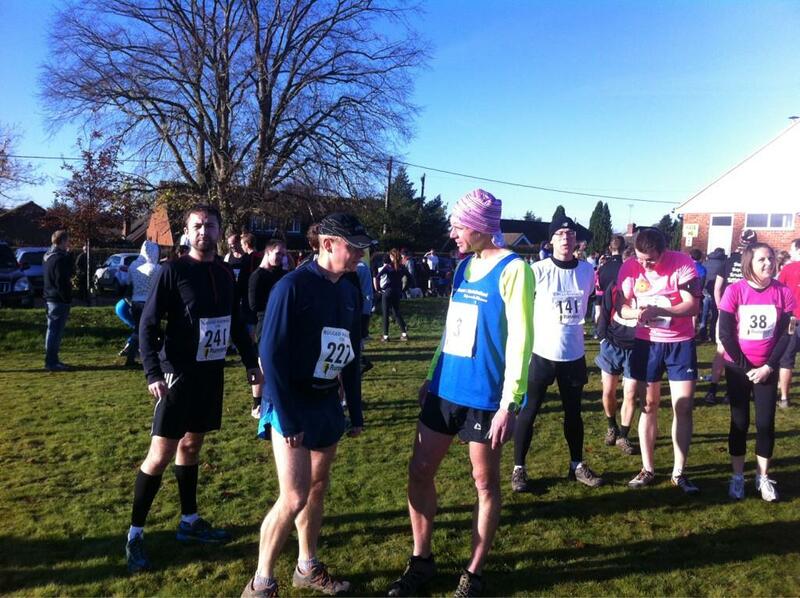 I found myself running with a chap who was running his third RR10K and we chatted a bit – which was nice. I found the road section quite tough and slipped back on a few people I was shadowing partly due to tiredness but partly due to the clompy shoes I was running. 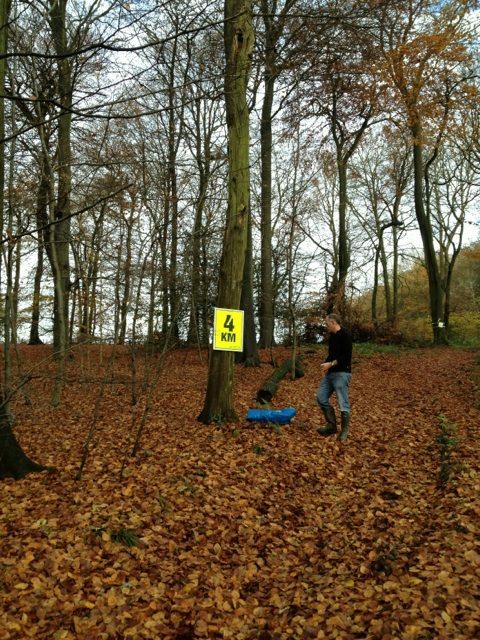 Note to self – get some proper trail shoes if going to do this often. Wooded decent after the first steep hill. 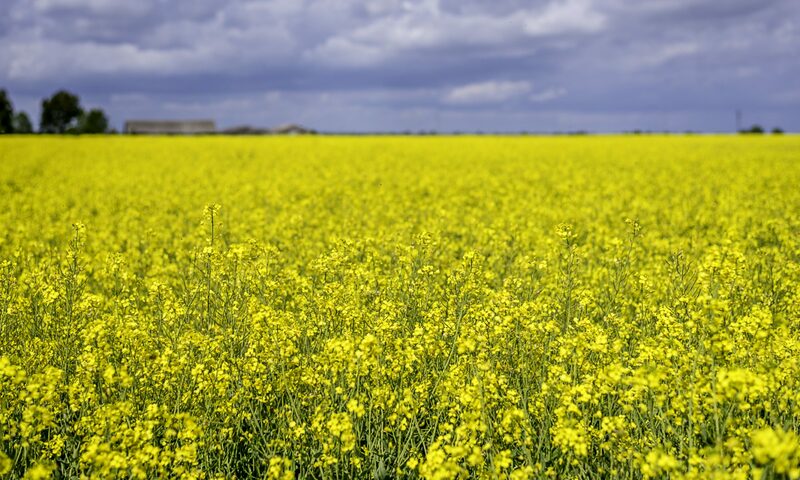 Photo by Barry Cornelius reproduced under Creative Commons Licence. Nearing the turn for home the road went up a short steep hill which was a mini killer before turning right onto a bridleway and back down into the valley bottom. We then ascended what felt like the north face of The Eiger (less the snow) and whilst I managed the bottom moderate hill – I didn’t manage the steep top section and walked – like most other people :). Shouts of encouragement from the marshals and spectators at the top of The Eiger spurred me on and a quick squiz at the watch suggested I may be on for a sub 60 minute finish. My faithful Garmin was with me on my journey and you can view the event page on Garmin Connect here. 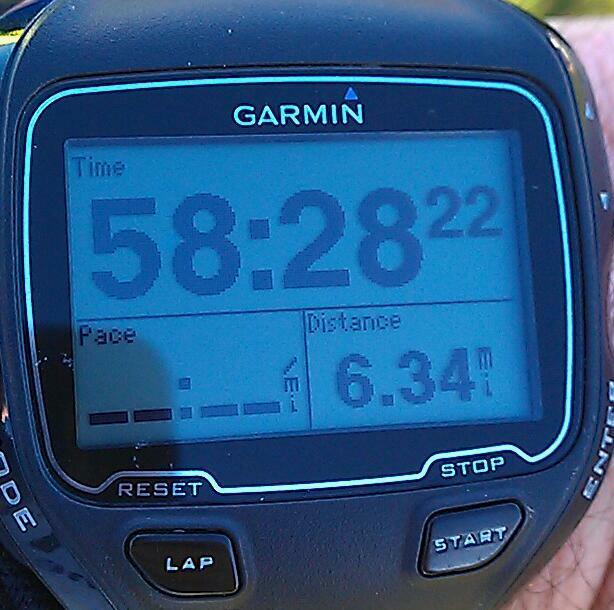 You can also see it on Runkeeper here. Home made cakes followed a-plenty and tales of the event from the gang. Johnny had problems with a injured calf and had to walk / jog back – but still came in before me. Some came home before me and some after. Catherine finished her first 10K in a brilliant 68:58 – very well done. My final placing was 155th out of 307 so almost exactly mid field. Well happy with that. Denis wrapped up the proceedings with thanks to all the volunteers and sponsors of the event – GO SUPPORT THEM – before presenting the prizes and that was it. 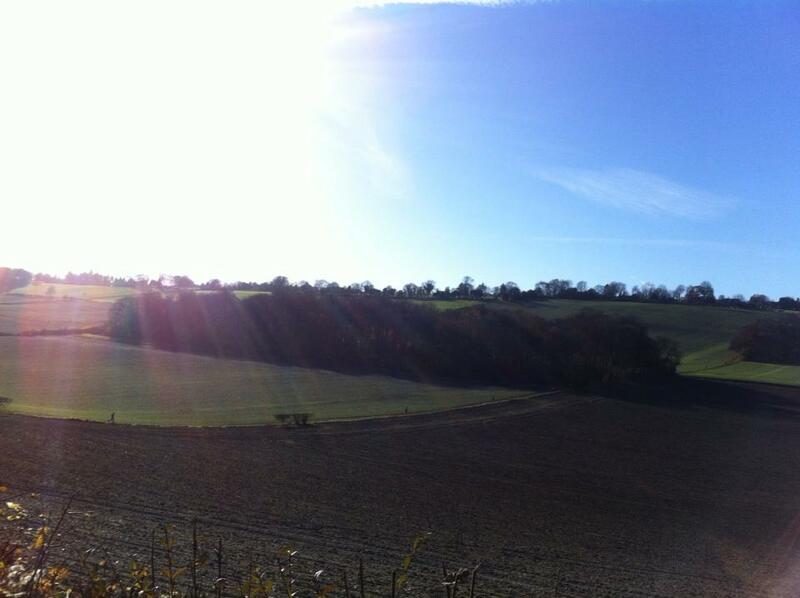 Hopped in the car and back home by 2pm having had a brilliant – and muddy – morning. I will definitely be entering RR10K 2013. 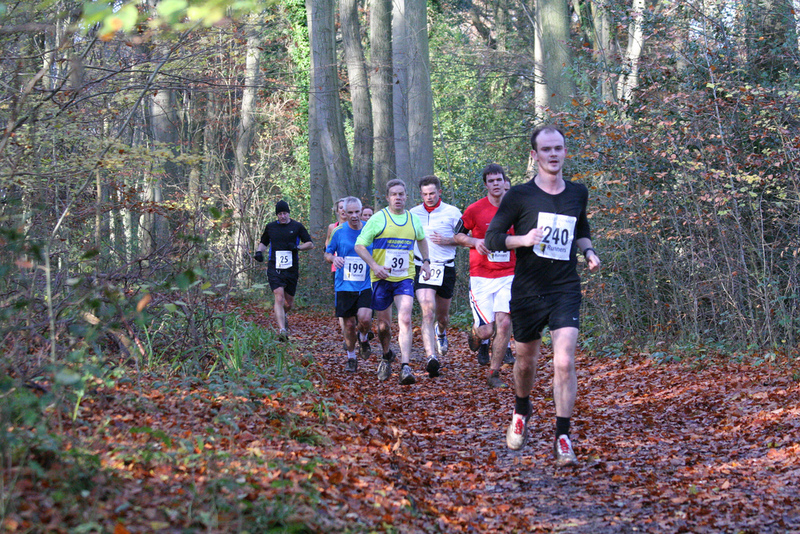 Date for diary – 17th November 2013 – same place, same route and hopefully a better time. The full results are now up on the RR10K website and an album of photos can also be found on flikr here and another set by Barry Cornelius here. As and when I find more and one or two with me in I’ll update the page. Very very massive thanks to Denis and all her team, all the volunteers on the day, and everyone who supported the event and took part. Great post & great to meet you. I’ll certainly be back next year.